ARTSHOP interviewed Vermont artist Jess Polanshek. Vermont illustrator Jess Polanshek spent most of her childhood moving among the cities and forests of Florida and Vermont. In addition to receiving a traditional art education, Jess has also travelled internationally, which has been a great influence on her artistic development. Emerging from these different environments, Polanshek’s art revolves around the northern forests and the creatures that inhabit them. 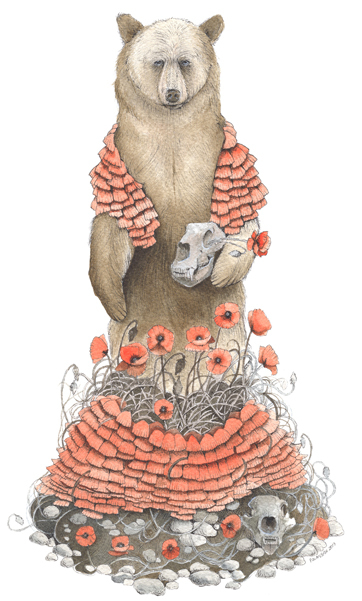 Focusing on high detail and loose realism, her art has evolved into an illustrative and whimsical style with a strong focus on the beauty and intricacies of the natural world. In the series “The Quilted Forest”, Polanshek imagines woodland creatures swaddled in nests made of leaves, branches, feathers and patterns. The prints are evocative of pysanka, a Eastern European tradition of egg decoration, where pattern and colour manifest brilliant objects. With clear lines and soft earth tones, her drawings make beautiful prints that celebrate the natural world around her home in Vermont. Where did the idea for “The Quilted Forest” come from? I was looking at a quilt that my grandmother made for me when I was little. One side is made out of dozens of different scraps of fabric, probably collected over the course of several decades. They have different patterns that are generally very uninteresting by themselves, but amazing as a whole. I wanted a way to combine my love of the forest with my fascination with patterns. Is that how you usually start a series of drawings? By being inspired by something from your world? Usually, when I start a series, there isn’t a real concept behind it at first. The concept of a series comes after I’ve started exhausting all the different aspects. 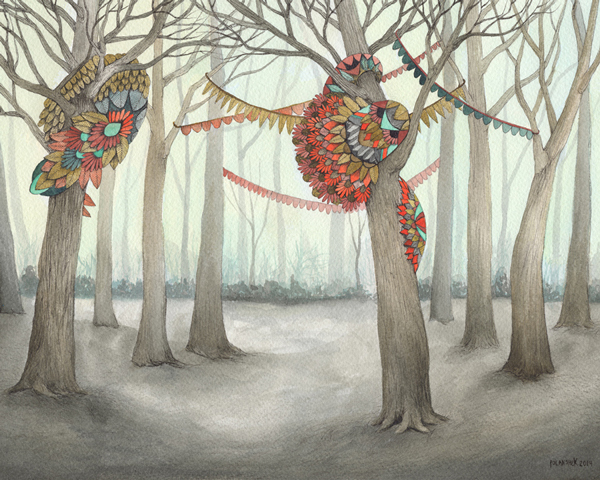 I realized that “The Quilted Forest” is not unlike the process of quilting. Each creature stands alone, but all together they make the forest I know and love. 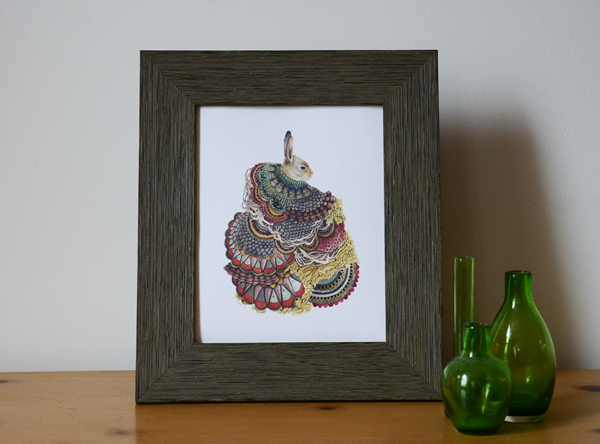 “The Quilted Forest” prints reminded us of Eastern European egg decoration. Is there a connection? I do love Eastern European patterns, but not specifically those applied to eggs. There is a lot of cross-over in that realm. Can you describe the process of making an illustration? How do you start? How do you know a piece is finished? I like to start with a solid idea. I start drawing it really loosely in pencil to get the composition. If that looks okay, I start adding pen. I like to have a full pen drawing before I start painting. A lot of people think that since I love itty-bitty details…that I’m a perfectionist, but it’s not true. My drawings don’t have to be perfect to be complete. I make lots of mistakes and turn them into something that works. When I can look at a drawing and nothing bugs me about it, it’s done. I’m a firm believer in going with my gut. If you were a woodland creature, what woodland creature would you be and why? I would want to be a porcupine. They are herbivores that climb a lot of trees, do a lot of night-time scavenging and they don’t have to hibernate in the winter. I almost said bear, but I can’t imagine sleeping for that long.